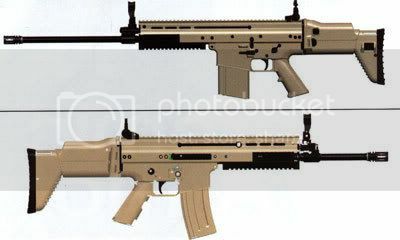 The top one is the FN SCAR-H and the bottom one is the FN SCAR-L.
Last edited by Listy; 30 Sep 06, 09:30. You are right, its the NLAW. A disposable fire and forget MBT killer. i was thinkin a bdm or perhaps a javelin but i didnt see the CLU so i wasnt sure. that looks like a buggered about BAR, Beyond that I have no clue.